Beautifully engraved certificate from the Flashnet Communications issued in 1999. This historic document was printed by the American Banknote Company and has an ornate border around it with a vignette of the company logo. This item has the printed signatures of the Company's President and Chief Operating Officer, and Executive Vice President, Chief Financial Officer and Secretary. This is the first time we have had this certificate for sale. 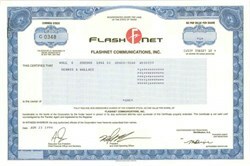 FlashNet Communications was a Fort Worth based Internet service provider that was acquired on May 31, 2000 by Prodigy Communications Corporation.